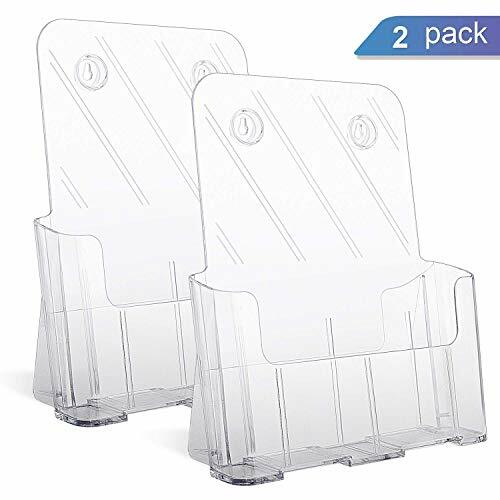 1InTheOffice Brochure Holder, Plastic Literature Holder, 4"W x 3"D"2 Pack"
Use the SourceOne Bi-Fold Booklet and Brochure Holder to organize and display your marketing materials easily. This container is made of heavy-duty plastic acrylic that's sure to withstand scrapes, bumps, and scratches. Additionally, its lightweight material allows you to bring it around wherever you go. Each holder is especially designed to hold 4-inch wide booklets, pamphlets, and brochures. The acrylic container can help you organize, display, and distribute marketing materials like company brochures, advertising leaflets, entertainment booklets, and other promotional tools. It is ideal for use by small businesses or at job fairs and travel expos. 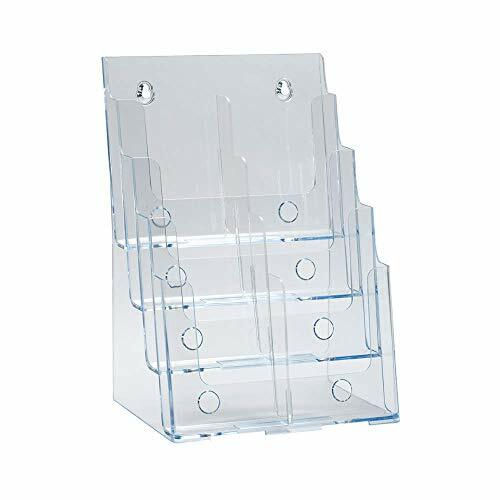 This holder features a clear, slanted back that lets you and your customers smoothly slide pamphlets in and out of it. And because it is self-standing, you can even set it on flat surfaces such as countertops or office tables. SourceOne guarantees you're satisfied with every purchase. All of our office and school supplies are readily available, and we offer only the highest-quality products. The SourceOne Bi-Fold Brochure and Booklet Holder is a hassle-free way to hold and display your marketing materials. Get your very own brochure holder today. 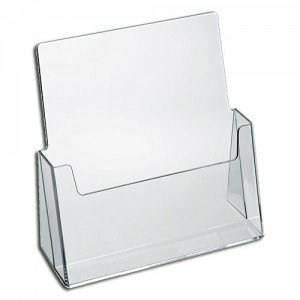 STURDY ACRYLIC CASE - This brochure holder is made of premium-quality clear acrylic. It is resistant to scrapes, and it won't damage your surfaces and countertops. This item is see-through, allowing people to view the brochures and booklets easily from afar. Additionally, it is lightweight and can be transferred from place to place with minimal effort. VERSATILE RACK - Display your small print advertisements, bi-fold brochures, and booklets for people to see and take. This holder fits items of up to 4 inches wide and is great to place on top of any desk or countertop for convenience and added decoration. SLEEK DESIGN - SourceOne's premium brochure holder features a clear acrylic material that lets you see the entire front page of each leaflet, brochure, or magazine. It is self-standing, so you don't need anything else to set it securely on a flat surface. Use it to display and distribute your print marketing materials. CONVENIENT STORAGE AND DISPLAY - You can effortlessly slide brochures and booklets in and out of this acrylic container. It also has a practical inclined support that lets people see its contents easily, even when standing. MONEY-BACK GUARANTEE - At SourceOne, we provide only the highest-quality office and school supplies. We value our customers greatly. We offer a money-back guarantee, but don't let that deter you from choosing our products. We have more stock than other brands, and it's all readily available, anytime. Get your very own brochure holder today. Keep all of your publications and large ads on display with the SourceOne Premium 4-Tier Magazine and Brochure Holder. This versatile rack can fit four different advertising materials in its holders at once. 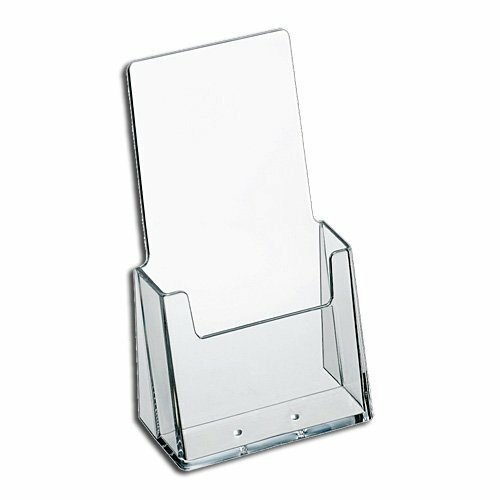 The entire brochure holder is made of a clear Lucite that's durable enough to resist scrapes, scratches, and impact. This type of material is see-through, allowing people to view your brochures' front pages clearly, even from afar. It is also lightweight and self-standing, so you don't need anything else to set it securely on a desk. Use this holder to display and distribute your marketing materials. 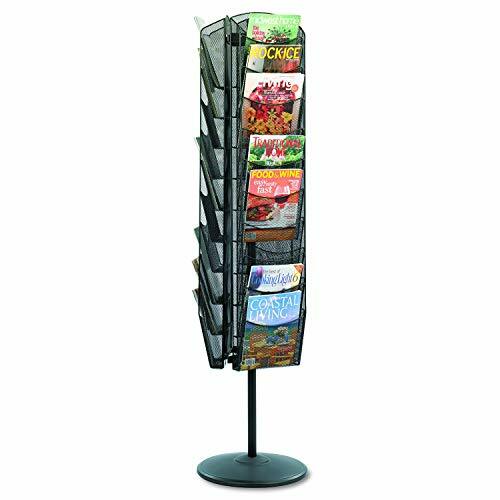 Place your large pamphlets, company brochures, leaflets, magazines, newsletters, and trifold booklets in this 4-tier rack for people to see and take. Each holder fits marketing materials of up to 9 inches wide. Additionally, it features a practical slanted back support that allows each displayed item to be retrieved smoothly. This holder is ideal to place on top of any desk or countertop for convenience and decoration. At SourceOne, we provide only premium-quality office and school supplies. We value our customers greatly. We offer a money-back guarantee, but don't let that deter you from choosing our products. We have more stock than other brands, and it's all readily available. Get your very own 4-Tier Magazine and Brochure Holder today. Present great content neatly and conveniently without spending big bucks. 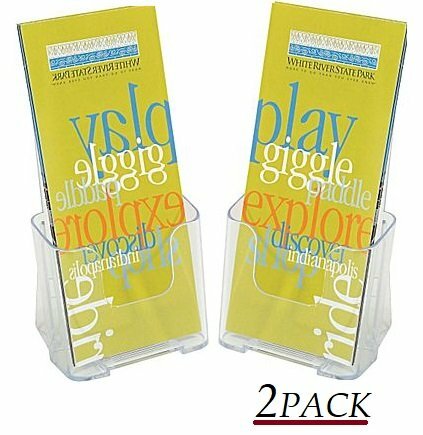 STURDY ACRYLIC CASE - This brochure holder is made of premium-quality clear acrylic plastic. This type of material is durable enough to resist scrapes and scratches, and it won't damage most surfaces and countertops. The holder is see-through, allowing people to view your brochures from afar. 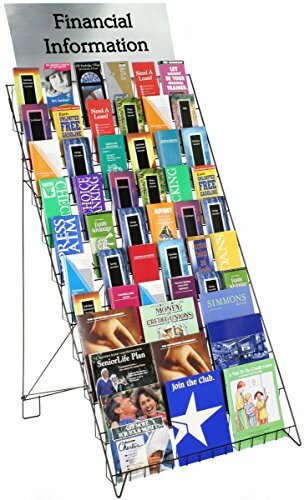 4-TIER RACK - You can place your large pamphlets, company brochures, leaflets, magazines, newsletters, publications, and booklets in this 4-tier rack for people to see and take. Each holder fits marketing materials of up to 9 inches wide. This is ideal to place on top of any desk or countertop for convenience and decoration. SLEEK DESIGN - SourceOne's Magazine and Brochure Holder features clear Lucite that allows the entire front page of a leaflet to be viewed easily. It is lightweight yet self-standing, so you don't need anything else to set it securely on a desk. Use it to display and distribute your printed marketing materials and advertisements. CONVENIENT STORAGE AND DISPLAY - Since this 4-tier rack features practical slanted back support, it is easy to slide brochures and booklets in and out. This container also allows you to display a lot of items at once. MONEY-BACK GUARANTEE - At SourceOne, we provide only premium-quality office and school supplies. We value our customers greatly. We offer a money-back guarantee, but don't let that deter you from choosing our products. We have more stock than other brands, and it's all readily available. Get your very own 4-Tier Magazine and Brochure Holder today. Maximize your marketing strategy with the versatile SourceOne Brochure Holder. 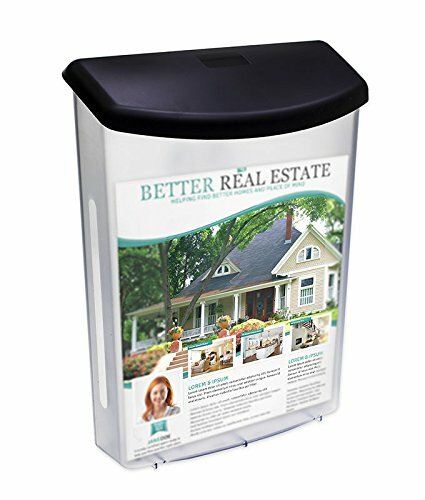 This magazine container is made of heavy-duty acrylic that's sure to withstand scrapes and scratches. Our product is especially designed for 8.5" x 11" booklets and smaller pamphlets. The acrylic container can help you organize company brochures, advertising leaflets, entertainment booklets, and more. It is very helpful for displaying and distributing your print marketing materials. It features a clear slant back that lets you and your customers smoothly slide pamphlets in and out . And because it is self-standing, you can even set it on countertops or office tables. It has overall dimensions of 8.5" wide x 9" tall x 3" deep. All our office and school supplies are readily available, and we offer only the highest-quality products. 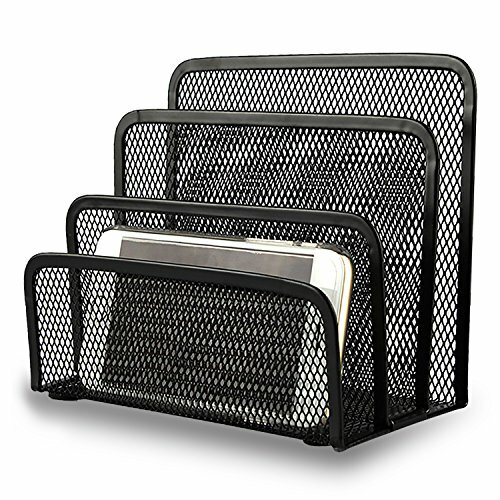 Organizing your office papers couldn't be easier with the SourceOne Brochure Holder. STURDY ACRYLIC CASE. Each brochure holder is made of premium acrylic. SourceOne uses durable acrylics because they are durable against scrapes and scratches. It won't damage easily on most surfaces and countertops. VERSATILE RACK. 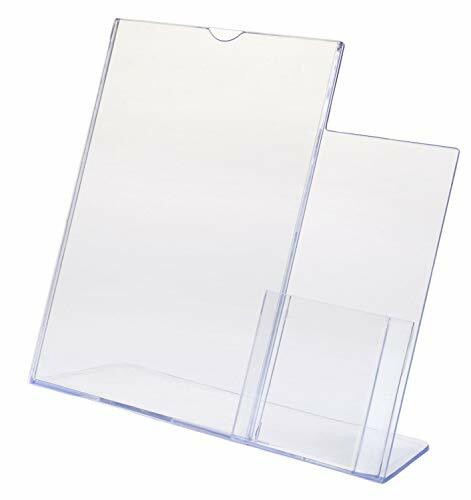 You can insert brochures, booklets, and magazine of various sizes, up to full size (8.5 11) brochures, in this acrylic holder. Buy one, or buy a twelve-pack and put them in different rooms of your house or office. SLEEK DESIGN. SourceOne's premium brochure holder features clear acrylic that lets you see the entire front page of each leaflet. It is self-standing, so you don't need anything else to set it securely on the table. Use it to display and distribute your print marketing materials. CONVENIENT STORAGE AND DISPLAY. You can easily slide brochures and magazines into and out of this acrylic container. It has a practical slanted back support, so you can move the brochures smoothly. MONEY-BACK GUARANTEE. At SourceOne, we provide only the highest-quality office and school supplies. We value our customers greatly. We offer a money-back guarantee, but don't let that deter you from choosing our products. We have more stock than other brands, and they're readily available. Try our stylish brochure holder today! 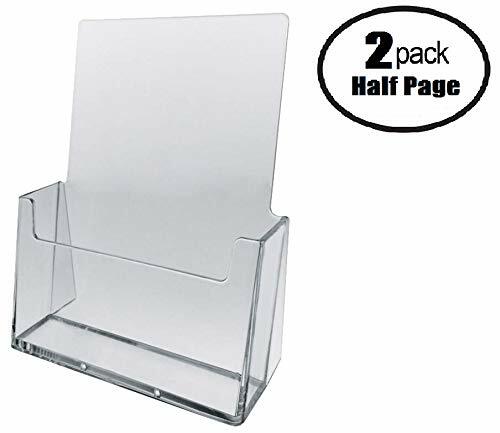 3-Tiered Clear Acrylic Combination Counter-Top or Wall-Mount Brochure Holder for 8 1/2"w x 11"h or 4"w x 9"h literature. Our holder measures 7-3/4" x 4-3/8" x 3-1/4" and is made of durable plastic. 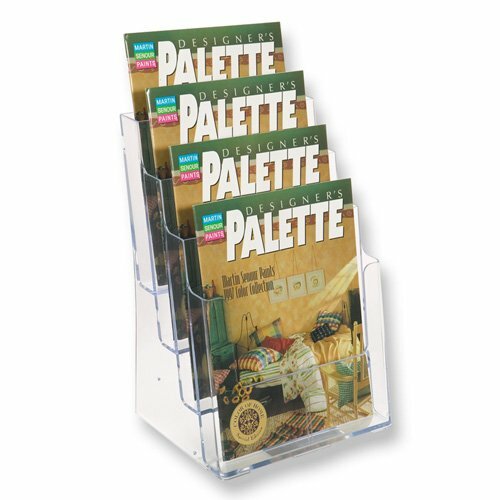 This literature holderHolds brochures 4-1/4" W x 1-5/8" D and displays a variety of literature at once, saving valuable counter space. Save space in the office, mailroom and home with Seville Classics 10 Slot Desktop and Mailroom Letter File Organizer. Constructed from industrial-strength steel wire and finished in bright, UltraZinc plating, the unit is sturdy, lightweight and easy to clean. Fully assembled, the organizer features 6 tiers of storage space with 10 slots measuring (9.5" W x 12" D x 3" H) designed to fit Letter, A4, and paper sizes up to 9" x 12". Use as a mailroom mailbox or a desktop organizer. Store forms, catalogs, invoices, papers, bills and other supplies. Ten clear plastic labels are included for personalization. Need more space? Stack multiple units vertically and adjacently for a total organization system. Assembly is simple; unit fits together in minutes with minimal screwing required. Industrial-strength steel wire construction finished in a bright UltraZinc plating for protection against corrosion in dry environments. 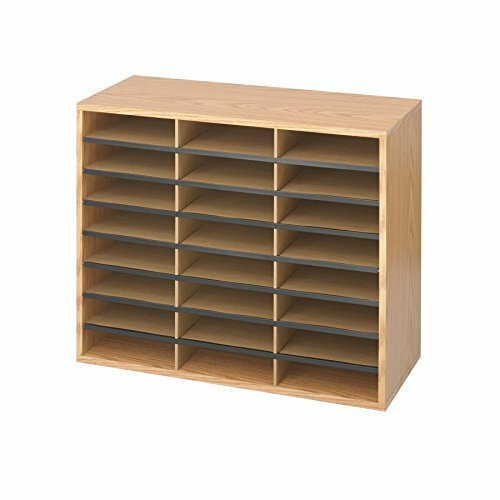 Safco Wood Adjustable Literature Organizer, 36 Compartment helps keep your office, classroom or printer room organized and running efficiently. Hardboard shelves form up to 36 letter-size compartments and remove easily to create larger storage areas for maximum convenience. Constructed of durable 5/8" furniture-grade compressed wood with an adjustable hardboard divider for long-lasting performance. The durable laminate finish complements any setting. This literature sorter can stand alone or be stacked up to three high in home offices, classrooms, and craft rooms anyplace that needs efficient literature organization. LITERATURE ORGANIZER. Safco Wood Adjustable Literature Organizer, 36 Compartment helps you sort, store and organize binders, journals, paper, and files on your desk or counter quickly and easily. STURDY STRENGTH. Durable 5/8 furniture-grade compressed wood with an adjustable hardboard divider and solid fiberboard back provide strength and stability for long-lasting performance. The durable laminate finish complements any setting. EFFICIENT ORGANIZATION. Hardboard shelves form up to 36 letter-size compartments. Shelves remove easily to create larger storage areas for maximum convenience. Units can be stacked up to three high. PRODUCT DIMENSIONS. Overall product dimensions: 39 1/4W x 11 3/4D x 24H. Shipping weight: 52 lbs. APPLICATIONS. Ideal for use in home offices, classrooms, craft rooms. 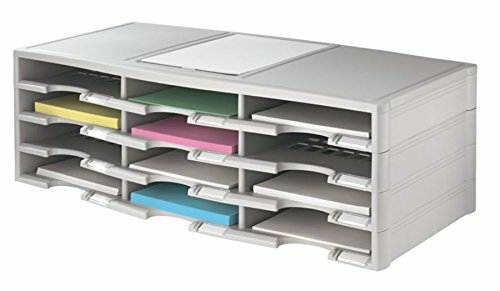 Safco Wood Adjustable Literature Organizer, 12 Compartment helps keep your office, classroom or printer room organized and running efficiently. Hardboard shelves form up to 12 letter-size compartments and remove easily to create larger storage areas for maximum convenience. Constructed of durable 1/2" furniture-grade compressed wood with an adjustable hardboard divider for long-lasting performance. The durable laminate finish complements any setting. This literature sorter can stand alone or be stacked in home offices, classrooms, and craft rooms anyplace that needs efficient literature organization. LITERATURE ORGANIZER. Safco Wood Adjustable Literature Organizer, 12 Compartment helps you sort, store and organize binders, journals, paper, and files on your desk or counter quickly and easily. STURDY STRENGTH. Durable 1/2 furniture-grade compressed wood with an adjustable hardboard divider and solid fiberboard back provide strength and stability for long-lasting performance. The durable laminate finish complements any setting. EFFICIENT ORGANIZATION. Hardboard shelves form up to 12 letter-size compartments. Shelves remove easily to create larger storage areas for maximum convenience. PRODUCT DIMENSIONS. Overall product dimensions: 19 1/2W x 12D x 16H. Total product weight: 18 lbs. Safco Vertical Desktop Sorter, 11 Compartment helps keep workspaces organized and efficient by storing letterhead, stationery, envelopes, literature and other letter-size materials within easy reach. Durable 1/2" thick compressed wood with hardboard shelves and solid hardboard back provide strength and stability for long-lasting performance. Easy assembly with pre-glued dowels. The durable laminate finish complements any setting. Ideal for use in personal workspaces, craft rooms, mail rooms, cubicles, and home offices anyplace that could benefit from space-saving organization. SIMPLE SORTING. Safco Vertical Desktop Sorter, 11 Compartment helps keep workspaces organized and efficient by storing letterhead, stationery, envelopes, literature and other letter-size materials within easy reach. STURDY CONSTRUCTION. Durable 1/2 thick compressed wood with hardboard shelves and solid hardboard back provide strength and stability for long-lasting performance. The durable laminate finish complements any setting. Easy assembly with pre-glued dowels. PRODUCT DIMENSIONS. Product dimensions: 10 3/4W x 12D x 16H. Product weight: 13 lbs. Weight capacity: Up to 15 lbs. APPLICATIONS. Ideal for personal workspaces, craft rooms, mail rooms, cubicles and home offices - anyplace that could benefit from space-saving organization. COMPLEMENTARY PRODUCTS. Pair with Safco Wood Adjustable Literature Organizer, 12 Compartment (9420), Safco Supplies Organizer (9452) or any professional product from the Safco family line. 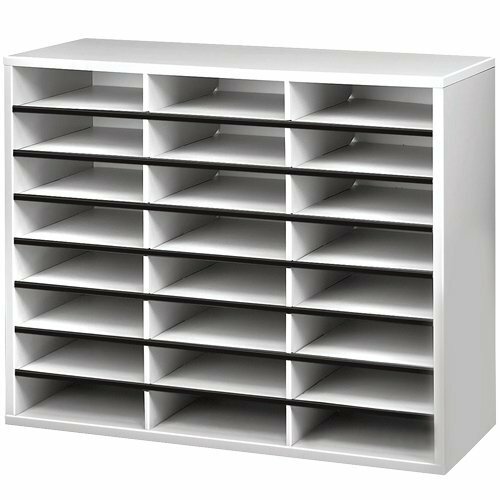 Safco Wood/Corrugated Literature Organizer, 24 Compartment helps you organize and store stationery, letterhead, mail, and documents quickly and conveniently. Manufactured with 5/8" compressed wood cabinetry with laminate finish and fiberboard inserts and back, the twenty-four compartments accommodate letter-size papers and documents up to 5 lbs. Decorative plastic molding on shelves also acts as a label holder for easy identification (labels included). Ideal for use in home offices, classrooms, and craft rooms. SIMPLE DESIGN. 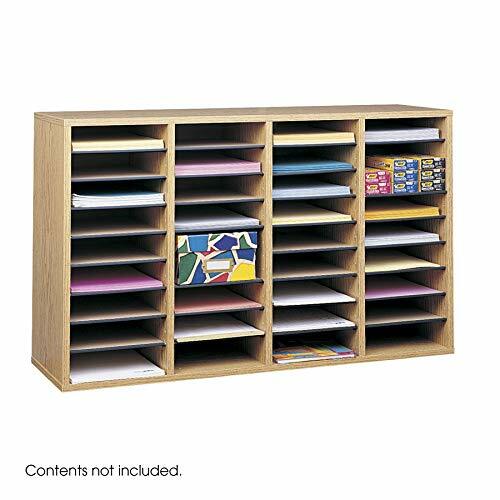 Safco Wood/Corrugated Literature Organizer, 24 Compartment helps you organize and store mail, stationery, letterhead, and documents quickly and conveniently. EASY ORGANIZATION. Manufactured with 5/8 compressed wood cabinetry with laminate finish and fiberboard inserts and back, the twenty-four compartments accommodate letter-size papers and documents up to 5 lbs. Plastic molding acts as a label holder (labels included). PRODUCT DIMENSIONS. Overall product dimensions: 29W x 12D x 23 1/2H. Final product weight: 30 lbs. APPLICATIONS. Ideal for use in home offices, classrooms and craft rooms. COMPLEMENTARY PRODUCTS. Pair with Wood Adjustable Literature Organizer, 16 Compartments (9422), Supplies Organizer (9452) or any professional product from the Safco product line. Convenient 24-compartment sorter keeps letter size sales literature, mail, forms, or other items organized. Features sturdy laminated particleboard shell and 200 lb. tested corrugated divider system with self-adhesive labels for easy file identification. Compartment dimensions: 2-1/2 H x 9"W x 11-5/8"D.
Organizes sales literature, mail, forms, and more! Letter sorter are an excellent way to keep documents together, but it still takes extra time if employees have to sort through stacks of unorganized folders to find the right one. Folders are made of wire, relatively strong, help put the file, but the file has three seat convenient and effective classification of office documents. Using new metallic materials, environmental protection spray, quality and stability, is your office preferred. This wire organizer is constructed of durable steel mesh and is built to last. This reliable tool provides years of easy organization. Add a touch of professional class to any home or office space with this black wire vertical file organizer. With no assembly required, this horizontal sorter is an ideal tool for fast and simple organization. KEEP YOUR DESKTOP ORGANIZED : Desk file organizer up to 3 folders(6.7 inches long by 3 inches wide by 5.2 inches high. ), Keep those important folders sorted and close at hand with this Mail organizer. Use with folders and labels for a more organized office. EASY VIEWING AND ACCESS TO CONTENTS : This vertical desktop organizer see-through mesh design clearly displays each folders center tab, so all it takes to find a folder is a quick glance. Folders come in and out quickly because of this organizer's open design. LOOKS GREAT ON YOUR DESK : An elegant addition to any desk in the home or office for folder organizer solid construction and classic design. 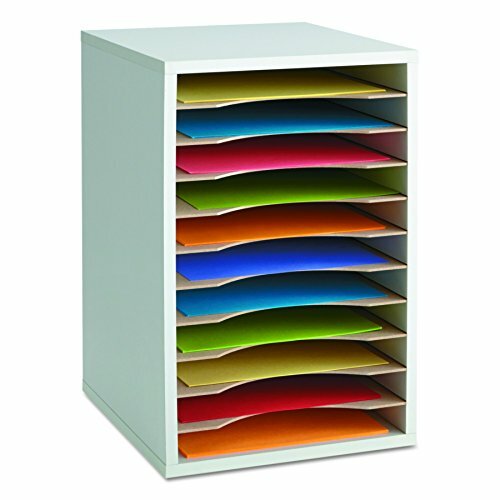 ORGANIZE AND DISPLAY FOLDERS : Ideal for sorting out letters, keeping pens, pencils, notebooks, highlighters, staplers, sticky notes, binders and other supplies organized,It allows you to store an assortment of items you'll need to easily access. 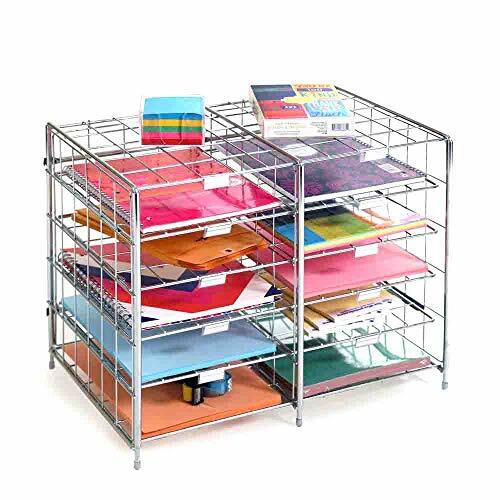 ENVIRONMENTAL PROTECTION : The paper organizer use environment-friendly spray technology, no harm to people or environment. Rust resistant with black powder-coated steel. 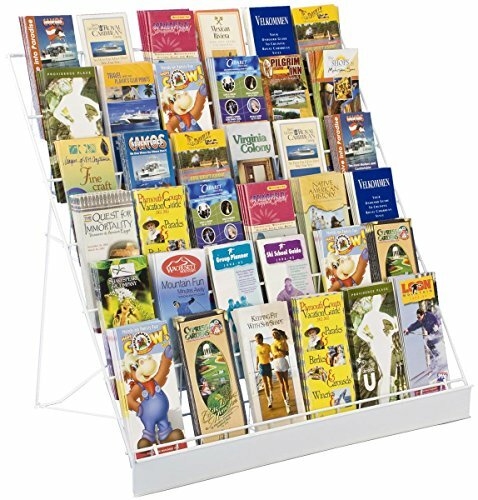 These wire literature racks come with removable dividers for 10 pocket or 20 pocket displays. The metal magazine stands feature a fold-up design for portability within an establishment. 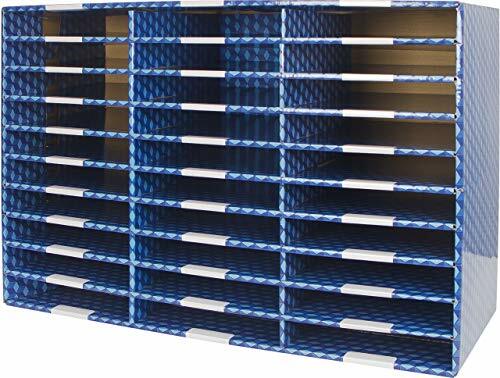 These wire literature racks have 17"w x 8"h x 1.5"d pockets and 8.5"w x 8"h x 1.5"d pockets with the divider for accommodating newsprints of all sizes. The floor newspaper displays unlock at the base for fast content changes. 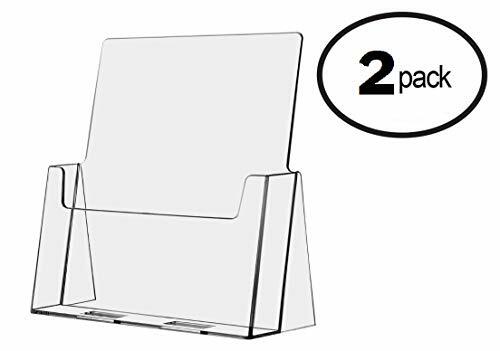 Removable Dividers for 10 or 20 Pocket Displays. Lightweight and foldable design for convenient carrying from one space to another. The stand includes a sign slot on top of the unit, but we do not provide any custom signage. 17.5w x 54h x 20d overall footprint for conserving floor space. Counter Top Display with 6 Compartments Economical, Versatile Retail Stand Open Shelf Design for Product Placement. This counter top display boosts POP sales! The tabletop holder, also known as a merchandise stand, stimulates impulse sales! This inexpensive metal stand has 6 deep 2-1/2" compartments. These versatile wire stands hold CD's, DVDs, books, brochures, magazines or other products. This space saving rack is also portable. Counter top rack products, also known as table top racks, are useful in grocery stores, gift shops and other retail settings. This counter top display is lightweight and made of durable gloss black wire. There is a black sign channel plate attached at stand bottom for logos or printed messages. This sign plate slot fits 18w x 2-1/2h printed material. We do not include a printed message for sign channels. Specifications: Overall Width x Height x Depth: 18.4 x 31.2 x 19.3; Pocket Width x Height x Depth: 18.0 x 5.5 x 2.5; Material: Wire; Color: Black; Placement Style: Counter / Tabletop; Features: Multi-Tiered; Pocket Type: Multi-Pocket. Features 12 compartments to separate forms, brochures, or mail Each compartment holds up to 1 ream of paper. Your ultimate solution for keeping your office etc. neat and organized. Features 5 magazine compartment slots. 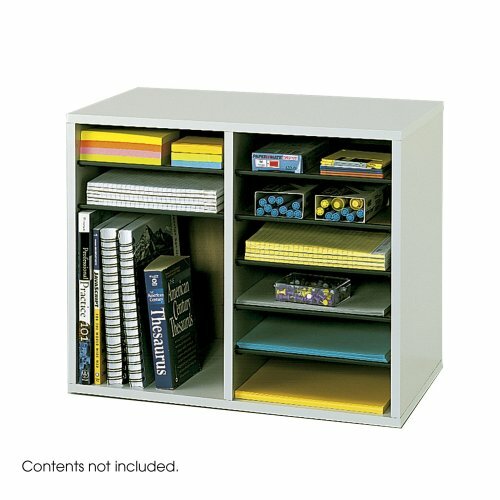 Ideal for storing you magazines, newspapers, documents, pamphlets. It's black epoxy finish suits almost any decor!. Ideal for offices, waiting rooms, classrooms etc. Measurements in inches; 27.5" H X 10" W x 4"D. Each compartment measures 10"W x 1.5" D x 12"H inches. Made of durable mesh steel with a black epoxy finish. Suits almost any decor. Features 5 magazine compartment slots. Each compartment measures 10W x 1.5 D x 12H inches. Mounts on the wall. All necessary mounting hardware included. Great for storing magazines, pamphlets, newspapers, documents and more. Ideal for offices, waiting rooms, classrooms etc. Measurements in inches; 27.5 H X 10 W x 4D. This wire display rack is designed to hold books, magazines, CDs or any other materials that would fit into the 2-1/2" pockets. The open shelf design helps organize and promote merchandise while encouraging browsing. There is a built in slot allowing you to insert your own attention getting sign and 10 rows of 27" wide pockets. The floor-standing fixture is lightweight, easy to set up, and folds up for easy storage. Dimensions: Overall: 29"w x 28"d x 47"h Pocket Size: 27"w x 2-1/2"d x 6"h.
CLEAR SIGN & BROCHURE HOLDER to hold an 8.5x11" ad or article and up to 75 tri-fold brochures. This is an easy and very effective way to promote a product, service, or idea. The sign attracts attention and builds interest while the brochures inform and develop sales. It's made of premium acrylic that is rugged and scratch resistant. This is designed for continuous use in high traffic areas. Just right for a business, office, retail store, market, or institution. 100% MONEY BACK GUARANTEE ensures this will be your best bet for a pleasing no-risk purchase. Many customers love this holder so much they return to buy several more to fully promote their business. HURRY AND BUY NOW while we have a new shipment in stock. This makes a much appreciated gift for friends, family, and co-workers - anyone who wants to get the word out! PROFESSIONAL AD FRAME & BROCHURE HOLDER perfect for all types of business promotion, information distribution, and getting out the word about your products and services. The big 8.5 x 11 inch sign holder attracts attention while the 4 1/8 x 4 3/4 brochure pocket provides details and your contact information. This is the classic 1-2 marketing method that always produces results. MADE OF RUGGED ACRYLIC clear styrene that holds up well and looks good for years of continuous use. This resists cracks, scratches, scrapes, and breaks that can plague lesser holders. It is clear so people can easily see the ad and brochures. This is designed to perform well in high traffic areas. It has a professional appearance that reflects well on your business. STABLE FREE STANDING only needs to be on a flat surface to work perfectly. Just right for counter, table, or desk. You don't need to secure it or have any additional equipment. This sign holder brochure pocket comes completely assembled and ready to use immediately. The pocket holds up to 75 standard tri-fold brochures. MULTI-PURPOSE FOR MANY USES including use in offices, schools, government buildings, trade shows, business expos, fairs, farmers market, and churches. The ad holder can display the entire front page of a leaflet, magazine, or brochure. This is lightweight and easy to transport. Increase leads, sales, and profits with this professional holder that builds awareness, educates prospects, and brings home sales. 100% MONEY BACK GUARANTEE ensures this will quickly become your favorite no-risk purchase. Many people are stocking up with several of these to outfit their business. HURRY AND BUY NOW while we have this popular ad and brochure holder in plentiful supply. This makes a fine birthday gift, holiday present, or anniversary gift. ROTATING DISPLAY. Onyx Mesh Rotating Magazine Stand spins 360 degrees to showcase journals, magazines, catalogs and other publications in a unique, eye-catching, 3-sided display. LONG-LASTING QUALITY. Durable, powder coat finish on the commercial-grade steel frame helps resist chipping or scratching while the steel mesh design promotes air flow to reduce dust buildup. PRODUCT DIMENSIONS. Three-sided stand measures 16 1/2W x 16 1/2D x 66H. Ten pockets per side. Each pocket holds 3/4 of printed materials or up to 5 lb. Total stand weight: 32.8 lbs. APPLICATIONS. Ideal for use in offices, collaborative spaces, hospitality areas, lobbies, libraries, classrooms-any place that could benefit from stylish, space-saving publication display.